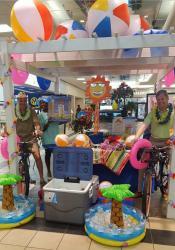 Manheim Atlanta's Doug Kramer, Chris Hill and Sonya Stancil-Garris test the Cargaritaville prizes! July 27, 2017-Tropical breezes blew throughout southeastern Manheim locations July 10-14, 2017, when Manheim’s annual Cargaritaville sales event delivered inventory treasure. This fourth annual event, held in partnership with NextGear Capital, offered some 40,000 vehicles at 20 Manheim locations and offered more than 30,000 participating dealers an opportunity to discover inventory gold. The clients were biting at the great inventory resulting in a sales rate of more than 62 percent. Dealers were heard commenting on the great energy, fun, and food. The sound of steel drummers, the thrill of contests, beach-themed prize giveaways, live entertainment, and delicious cuisine could be experienced at each Manheim location as they added their unique flair to the sales festivities. Even the Manheim team members joined in the fun with costume contests, photo booth opportunities and festive snacks for all. NextGear Capital partnered with all participating locations to offer special promotional terms and Margarita Machine giveaways. The week’s grand prize was a 2016 Kawaski Jet Ski given away at Manheim Orlando to the lucky winner, Ed Burgess with Mazda of Roswell, Ga.
Cargaritaville began in 2013 at 11 Manheim locations in Florida and the event expanded to Alabama, Georgia, North Carolina, South Carolina and Tennessee locations in 2016. Participating locations this year included: Manheim Atlanta, Manheim Caribbean, Manheim Central Florida, Manheim Orlando, Manheim Tampa, Manheim St. Pete, Manheim Lakeland, Manheim Fort Lauderdale, Manheim Palm Beach, Manheim Georgia, Manheim Daytona Beach, Manheim Jacksonville, Manheim Fort Myers, Manheim Nashville, Manheim North Carolina, Manheim Darlington, Manheim Metro Atlanta, Manheim Birmingham, Manheim Pensacola and Manheim Statesville.